Most people hate their alarm clock. That's why Eoin McNally and Ian Walton created the glo Pillow. Embedded with a grid of LEDs, it uses nothing but light to wake you up. About 40 min. 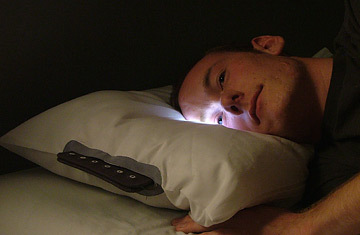 before reveille, the programmable foam pillow starts glowing, gradually becoming brighter, to simulate a natural sunrise. This helps set your circadian rhythm and ease you into the day.